The 2004 FJR 1300 for Sale is a beautiful pewter gray color and in fantastic condition with low Miles (6700). This model has ABS, power windshield, a (Shoe Type) Factory Trunk and Saddlebags. The FJR is a very fast and nice handling bike. GoGoCycles would also encourage bikers to submit a review of the 2004 FJR 1300 for Sale to help potential buyers make informed decisions and to benefit the biker community as a whole. The motorcycle is located in Oro Valley near Tucson AZ Arizona and my asking price is $7500 so call me, Brian, today (NO EMAILS at Nine - *eight11 One zero Seven Zero and don't forget to mention that you found this ad on GoGoCycle's Used Motorcycles and Parts for Sale www.gogocycles.com when you call! 04 Fjr still for sale? Please call Phillip at 651-269-4621 to discuss Bike. Join in and write your own page! It's easy to do. How? 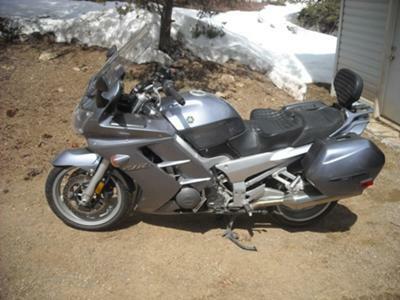 Simply click here to return to YAMAHA FJR1300 .